Right now, on the outskirts of Redding, a rampaging wildfire is doing something that was once unusual: It's burning fast...downhill. "Fires are burning almost as fast downhill as they burn uphill," said Cal Fire spokesman Scott McLean, from the scene of the Carr Fire, which by midday Friday had torched more than 44,000 acres and was only 3 percent contained. That's not typical. One of the first things wildland firefighters learn is that fires burn much faster uphill. It's simple physics: heat rises, so the heat from the fire warms and dries out the upslope fuels fastest. It’s also a case of proximity: if you draw a picture of a flame on a slope, you’ll see that there’s a much shorter distance between flame and ground on the uphill side than downhill, so the fire can jump directly from one blade of grass to another. Then there's the wind. During the day, when fires are typically most active, wind tends to blow uphill, carrying heat and embers up the slope. Facing a fire coming up a hill has long been a serious threat to firefighters, and fires moving rapidly uphill have been implicated in many of the deadliest fires for firefighters, such as the South Canyon Fire of 1994 and the Mann Gulch Fire of 1949, which killed 14 and 13 firefighters, respectively. Because of the dangers of fighting a fire burning up a hill, crews working in hilly terrain take advantage of the opposite effect, anchoring firefighting operations on the downhill side of a fire and using the slope as a buffer zone as fire will move more slowly downhill. But this trick has become less reliable in recent years. Chris Anthony, a division chief at Cal Fire who has worked on fires for more than 25 years, has observed more examples of fires spreading rapidly downhill. The Carr Fire is just one example. Researchers haven’t measured this trend yet, so nobody knows for sure why this might be happening, but Anthony has an idea. “One of the things that really contributes to that, right now, is we came out of this very long drought period, and we still have a lot of fuels out there, that are very dry or very dead, even," says Anthony. "And so they carry fire much more rapidly than prior to the drought." The wet winter that followed the drought added to the fuel load. The hillsides are now so packed with dry grasses that the slope matters less on a downhill run. When there’s so much ready fuel, combined with hot, dry conditions and strong winds, fires just move faster in all directions. An uptick in downhill fire behavior might also be related to the increase in nighttime temperatures. On a typical day, local winds move uphill during the day and downhill in the evening. In the past, cooler nighttime temperatures could impede fire activity driven by these evening winds. But if fires remain active at night, local evening winds could drive faster downslope fires. For now, the trend toward more intense downhill fires is anecdotal, and some researchers are hesitant to speculate why firefighters might be seeing this behavior. “Is that a statistically significant trend?" asks Nick Nauslar, a fire weather forecaster at the National Weather Service’s Storm Prediction Center in Oklahoma. "And if so what might be causing that? There would have to be a couple more steps before I try to make assumptions or formulate theories on why that might be happening." Fires that burn quickly downhill are particularly worrisome because communities are often situated at the base of the mountains. Regardless, there have always been some downslope fires that spread quickly. Santa Ana and Diablo winds typically run downslope, says Nauslar. These winds have long driven most of California’s most destructive fires, including the 2017 Wine Country Fires, which were the state's deadliest fires, and the Thomas Fire in Southern California, now the state's largest fire on record. There’s mixed evidence as to whether climate change is affecting the strength or frequency of these winds, but they were especially powerful last year. “We saw some of the strongest winds in recorded history, especially from that direction, that northerly, northeastern component winds, and that's downslope,” says Nauslar of the Wine Country fires. Rapidly spreading downhill fires also played a major role in last winter's Thomas Fire. It coincided with the longest Santa Ana wind event on record, according to a recent analysis of the 2017 fires led by Nauslar. Fires that burn quickly downhill are particularly worrisome because communities are often situated at the base of the mountains. 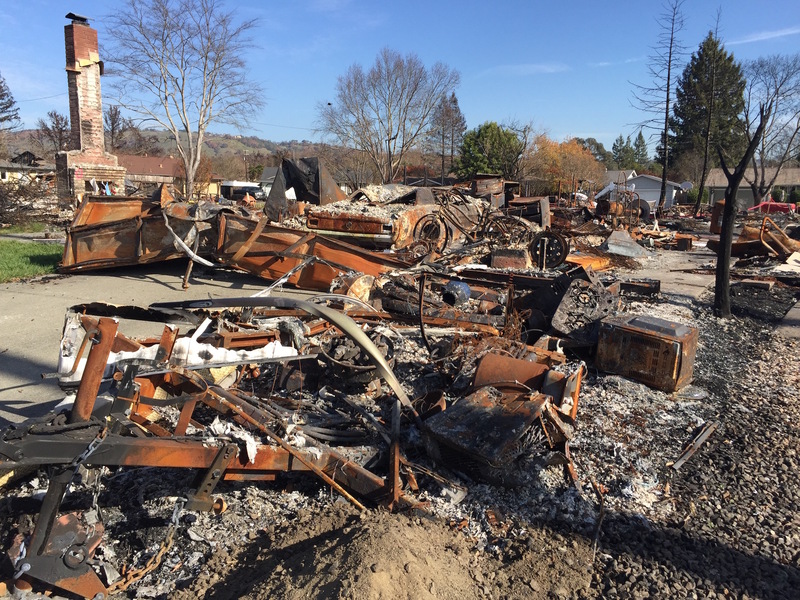 Last fall, it was a downslope fire that pushed into Santa Rosa and drove the destruction of Coffey Park and other local communities. Firefighters are keeping careful tabs on changes in fire behavior to help prevent tragedies like what happened in Santa Rosa. “If we get reports that we're going to have a large downslope or down-canyon wind in the evenings," notes Cal Fire Battalion Chief Jonathan Cox, "there's things we can do such as reinforcing the downhill line, putting additional resources below the fire in anticipation, and understanding that when the fire comes downhill what the risks might be as far as communities or hazards or whatnot that we need to protect." The tools are there to manage downhill fires, but Cal Fire’s general approach to firefighting may need to readjust to changing times as these difficult conditions become more common. 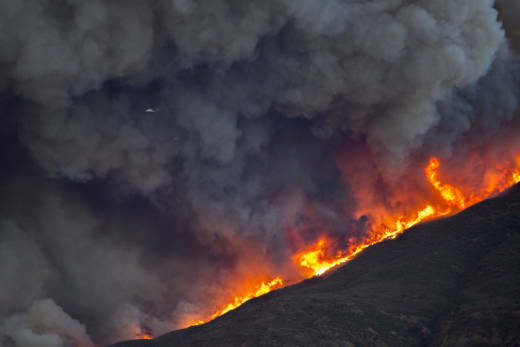 Climate change is expected to continue to increase nighttime temperatures and the types of extreme weather that has primed fuels this year for faster, bigger fires. “It makes us really have to reevaluate our strategy," says Anthony, "and not just expect that fire to just transition to something that is going to burn less intensely."